Butchering your own kill is the only way to make sure you get the most bang for your buck with your meat, but how do you make sure you’re doing it right? I have butchered my own kills since I was a teenager. When I worked at a bar and grill at the age of 15, I was expected to butcher a whole side of beef for all the meat we could render and now that I am an avid hunter, I always look to get the most out of every kill. It is a point of pride that we butcher our own meat. That being said, there are some simple tricks that can help anybody make the most of their kill. Part of being efficient in butchering is knowing the anatomy of mammals. You need to understand that muscles come in groups. You need to know the internal organs common in any mammal as this knowledge will give you a feel of how to handle one. The first step in butchering any mammal is to gut the carcass. This means you will open up the belly and pull out the internal organs. It is important that you do this carefully because spilling the intestine or stomach can ruin your meat. Using a knife with a gut hook is a good idea for this process. Most people start between the legs and open up the belly up past the sternum. This opens up all kinds of opportunities for more meat. BUTCHER WITH EASE. The perfect tool to help you finish even the largest butchering jobs with ease. Crafted with high carbon stainless steel, this knife is conical ground and ice tempered to ensure long-lasting sharpness. SOLID & STRONG. 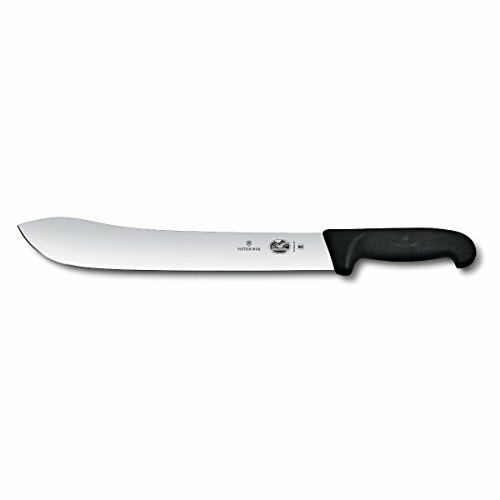 With a hollow-ground and straight edge, this knife has the heft and strength to cut larger pieces of meat effortlessly. A built-in finger guard provides safety and the laser-tested blade is durable even with the largest butchering tasks. EASY HANDLING. This knife features an ergonomic Fibrox Pro handle for a non-slip grip -- even when wet. This exceptional knife is weighted and balanced for easy handling and comfort. From the internal organs, you can eat the liver, kidneys, and heart. The liver and kidneys are a bit of an acquired taste, but the heart is a pure delicacy. My son and wife wait every year for me to bring home deer heart from my hunting ventures. You can also cut just below the jaw to remove the tongue for a tasty meal. Once you gut and skin an animal, it brings around the task of quartering the animal. This is a big area where hunters waste meat. The most important point of focus for quartering an animal is to cut close to the bone. This requires a flexible knife that can work around the joints and tissues of the animal. It is also important that you bring home parts like the ribs that can be used for several dishes. You have to use every piece of meat. We even use the hides when possible. As you cut meat away from the bone, you have to be practical. When dealing with ribs, it is often smarter to cut the meat away from the bone versus freezing the meat with the bones. When cutting up the shoulders, it is smart to use a saw to cut through bone versus cutting the meat away from the bone. Your goal is to trim every ounce of meat away from bone that you can, but bone-in roasts are fine too. 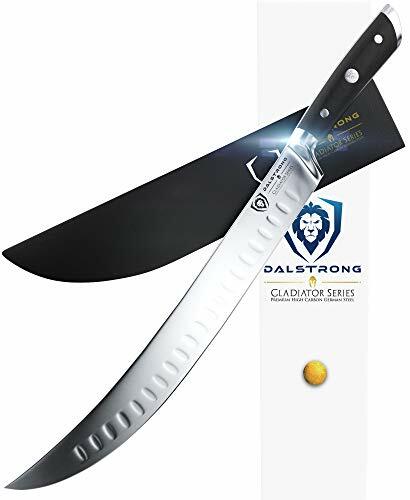 A welcome addition to any butcher or serious chef's arsenal, the Dalstrong Gladiator Series 10" professional breaking knife is a powerhouse in nose to tail sectioning and portioning, allowing you to glide through steak like butter, trim briskets effortlessly and break down large game without getting lost in the meat. The curved blade is designed to create leverage, and complete cuts in a single motion without sawing. The knife is expertly crafted and thoughtfully designed to masterfully slice through flesh, break through cartilage and trim fat from beef, pork, poultry, fish and other meats. Improving this blade further are the rock-hollow divots, which minimize adhesion to prevent stuck on food and reduce friction for a more comfortable cutting experience. Featuring a beautiful, ergonomic and ambidextrous black pakkawood handle imported from Spain, with full tang and triple riveted, the Gladiator Series butcher knife is carefully designed for efficient and precise butchery work. Included for the blades protection is a BPA free PerfectFit knife guard. In the end, your priority must be to use every piece of the animal. Using these tips (and with a little practice), you should be able to make the most out of your kill. Hopefully, you could also encourage yourself to be efficient in your butchering skills so this tradition can continue. What do you think about these efficient butchering tips? Share your thoughts in the comments section below! Editor’s Note: This post was originally published on October 26, 2017, and has been updated for quality and relevancy. You Lost or Something? – Use a Map & Compass it works! Tired & Stressed? – Watch a Movie! Planning something? – Nike, Just Do It! Feeling Thirsty? – Coke is it – Adds Life! Hungry? – Nissin Cup Noodles! When in Rome? – I haven’t the slightest idea… Awoooooooo! Because Now is the time for Cow! Patch Adams! or was it the Late Robin Williams?! Next time include more data on knives and let’s hear about the best way to sharpen “stainless high carbon” steel. High carbon steel is my favorite but Stainless steel is quite different interms of sharpening and handle preservation.